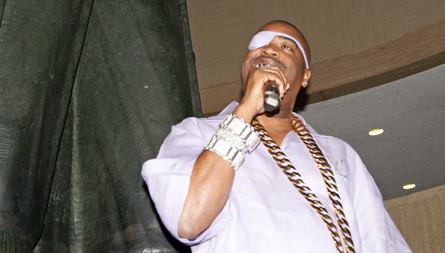 The legendary Slick Rick rocked the house at the Pennsylvania State Museum on Aug 2. When Slick recorded “Teenage Love” in 1988, the debonair/reserved rapper was doing more talking than singing for his rendition of the “Theme from Mahogany.” But during his performance for “Teenage Love” in Harrisburg, he put more umph into singing the timeless Diana Ross song. Some other songs from the night included “Mona Lisa” and “The Moment I Feared.” Slick was clad in a lavender button-up shirt, tan pants and lavender shoes. His signature truck jewelry glistened in the museum’s lights. The African American Chamber of Central Pa. promoted the show and said Doug E. Fresh was the special invited guest on its flyer. A reliable source told our website that Doug was still in Harrisburg when Slick’s show started, but Doug was not able to perform at Slick’s show. A few hours before Slick’s performance, Doug headlined Dauphin County’s Cultural Fest.